APRS allows users to send real time text messages, GPS coordinate data, weather information, and many other things over ham radio frequencies (normally 144.390Mhz on the two meter band) that are picked up by nodes and logged on the internet. APRS is a form of packet radio so if you tune to the frequency used it will sound a bit like a dial up modem. Many Kenwood radios have built in TNC’s or APRS capability, however, the TM-V71A doesn’t have any of these features. Only a standard PS/2 data port on the back of the radio. I own a TM-V71A and it is a very powerful and feature rich radio. When used of APRS the dual band capability is great as you can do voice on one side and packet (ARPS in this case) on the other. This allows me to carry one radio in the truck and talk to other 4×4’s/hams and run aprs. The radio boasts 50W of power on both 70cm and 2m. After doing some research I found that getting an aprs tracker such as the tiny track series or the open tracker would be quite simple to do. Deciding on the tracker was a little difficult. All of them have numerous bells and whistles and the prices can very by quite a bit. I decided on the OpenTracker+ as it had many of the features of the TinyTrack 4 but only cost about half. I wanted my tracker to utilize the data port on the back of my radio so it was out of the way and didn’t interfere with any other functions of the radio. After a bit of researching I found a cable that Argent Data confirmed would work with my OpenTracker and also works for the Tiny Tracker. However, instead of paying $19 for a cable I opted to make my own out of a $4 male to female serial cable (which when cut in half would provide me with a male DB9 cable and a female DB9 cable) and a male PS/2 connection off of a old computer mouse. 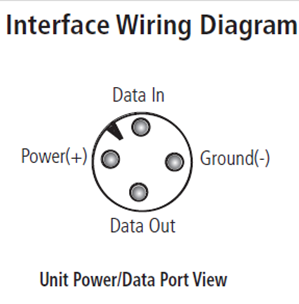 Note that the PS/2 connector from a computer mouse or keyboard only uses 4 pins and the unused pins are not wired so you will need to disassemble the connector not just cut the wires. 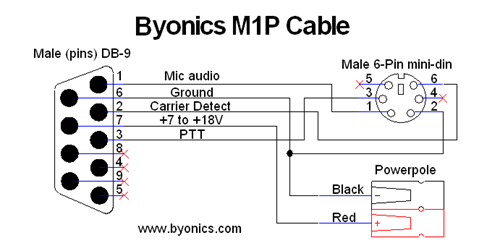 After I cut the male/female serial cable in half and had my PS/2 connector apart I used this diagram to solder the wires from the male end of the serial cable to the pins of the PS/2. For interfacing the Tiny Track/Open Tracker+ to my Garmin GPS (GPSMAP 76CS) I used the female end of the male/female serial cable I cut in half earlier. This particular GPS uses a Garmin 4 pin round connector to send data via serial. So I spent $4 on the 4 pin round connector housing and used the other end of my $4 male to female serial cable. Here is the pin connections to make the cable. The tracker (DB9 Male) is on the left and the GPS (4 Pin Round) is on the right. Plug in the tracker into the data port on the back of the radio and power. Then the tracker into the GPS. Once everything is hooked up turn on your Kenwood and tune whatever side of the radio you want to use for aprs to you local aprs frequency (normally 144.390Mhz) and specify in the radio’s menu that this is the side of the radio to use for data (see owners manual on how to specify data side of radio). Once that is done a little D should appear on that side of the radio. Now look at the trackers status light. It should be blinking green if it is hearing packets and solid red when it transmits. If it is blinking red check to see that your GPS has a good fix on your location. thanks so much…will review your article and pictures.